Delco style with much heavier wiring and free shipping to 50 states! The only kit available anywhere with all these features and at this price! Aluminum case, red or black non-vented heavy duty cap and rotor, giant 10.5mm red spiral core resistor spark plug wires with watertight boots, high performance powder coated electronic coil (not the can type), and four completely custom connecting wires for setting timing, braided coil to distributor resistance wire, and wires to allow your outdrive to shift as it does now-nothing else to buy. 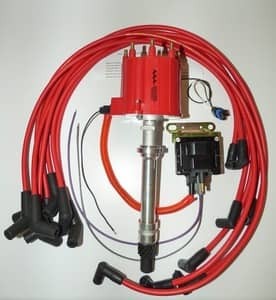 Completely replaces all your old ignition system with modern fully electronic advance (no centrifugal weights or springs to break or rust) and no vacuum advance pot as we're now fully electronic. Two screened vents which designates approved for marine use. Please inquire at info@aaamarine.com or 1-877-253-7882 if you have questions. Spare parts available from most auto & marine stores, and from us of course. NOTE: Don't overlook our latest 65000 volt HEI marine distributor on our home page. See what your new .060 spark plug gaps will do for you!